The History of Altear is varied and vast in its grandeur and sense of abhorrent action. Wars that have killed thousands have been fought; heroes have arisen; and villains have fallen. The basic time reckoning found within is known as “After Time of Ancients”, or ATA. In historical context the Ancients were the most ancient or leading deities of antiquity that later birthed or created the Immortals, the gods that all modern races claim descent from in some way or form. The Time of Ancients marks the pre-history of Altear when the Ancients of old were born and walked the earth. It is the creation and the early times of the Immortals as they formed the foundations of the nations of Altear. In the beginning there was only dark, and the primal realms of Ice and Fire. The realm of ice was known as Niflheim and the realm of fire Muspelheim. Both realms were eternally growing and at one point they met. A flash of light struck the darkness and suddenly light was born. The stars and the sun flared and the lands of revealed. Where the two realms had met a great shuddering of energy struck the ground and a single sprout arose. This was the first evidence of life in the world, and as the first it sprung forth with the magical nature it would come to exude. This life was the world tree, known as Crann Beatha to the Sidhe, and Yggdrasil to the Norlanders. It has many names, but to many it is the Tree of Fate, the tree of life. It is what gives the world magic and its growth is what spawned the beginning of all things on the lands of Altear. As The World Tree reached towards the heavens its boughs cast a shadow upon the soil beneath. As the tree grew greater a forest sprung up around it. From within the forest, darkness began to spread throughout the valley beyond. The tree is not the creator life persay, bit is the gateway to life. As it marks and connected all to the beyond the tree brought forth more than just itself, but those who would come to shape the world. The Ancients were created when the Tree’s connected to the sky and the cosmos. Reaching out the Tree of Fate struck a cord and a great sound fell across the land. A tear appeared and bits of ice still left from the meeting of the realms of Ice and Fire shuddered. Cracking open the revealed a grouping of figures and shapes. Entities that suddenly awakened to full realization of their purpose and spread out in the forest. Some fled suddenly into the fareast as others came to stand near the tree itself. First among them was the oldest and perhaps the most powerful. To the Norlanders she is called Audumbla, to the Sidhe she is Danu, and to the Ashurids and the Djinna she is Ishtar. 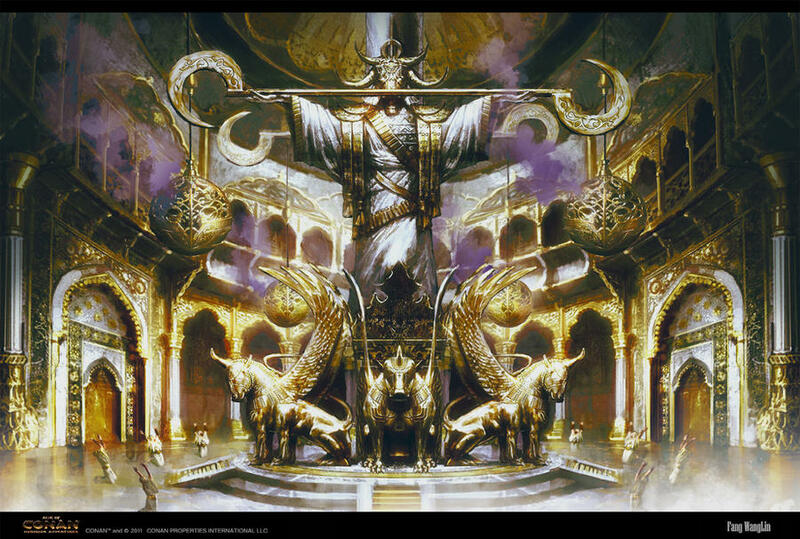 The second oldest was the woman Tiamat the great dragon, along with her were the brothers Ashur and Marduk. Then there was Bori of the white hair, and future father of all Norlanders. Alongside him was the giant Ymir the father of the Jotnar. There were many more ancients such as Izanagi and the Jade emperor who would found the lands of Ishua. There was brave Craftsman and his friend Parun the father of the Vila. So many, and yet so much forgotten. There were many stories to be told as the Ancients spread out and began to claim their own future Kingdoms. From their interactions and their creation would be born the immortals. The Tribes of Old. Each over time would then spread out as the tribes began to spread. At the birth of the Tribes the Time of Ancients ended. 0 ATA – The Tribes of Old are created. The Tuatha De Danann from the World Tree, the Aesir-Vanir, and the Jotunn. Ishtar also births the twins with her lover Ashur who will found the Ashurid Empire. 5 ATA – The weavers of Fate, the Norn, banish all non-Ancient tribes from the lands of the World Tree. They forever take command of the lands and charge the godlike Furies to guard the Tree against all comers. 12 ATA – Prince Nuada of the Tribes of Danu leads his people away from the lands near the Tree where the continents of Everyn and Ishua. The children of Parun travel with them for a while and then move north settling along the coast beyond the mountains that will become known as the Iron Heights. 15 ATA – The Ashurite tribes wars with the sons of Kaleel and Ibalis. Ashur is slain in the battle with the clans that will become known as the Jinna. The Ashurite swear undying hatred against the Sons of Kaleel and Ibalis. 50 ATA – The Aesir and Vanir tribes unite creating the basis of the Aesir race. Allfather Odin is crowned King of all and leads his people in an ongoing feud with the Tribes of the Jotnar, the children of Ymir. 101 ATA – The long life of the Immortals reaches is midtime, Nuada of the Tuatha De Danann argues with his own folk leading to the schism of Prydain. The twin chiefs who deny him remain as he and his people cross the mountains. Lord Odin hangs himself on the World Tree after defying the rule of the Norn and slaying several Furies. He gains the power of fatebinding magic after bearing himself to untold pain and gains insight into the power of the Tree. He eventually strikes a deal with a Jotunn shaman to gain more power. 103 ATA – The lands of Eastern Ishua fall into war as the First Emperor of Qi’in arises. 229 ATA – War of Ragnarok occurs as the Jotnar under Loki the Trickster assault the fortress of Asgard and attack the Aesir Immortal Tribe. Odin Allfather is killed in the battle falling under enemy swords, Thor is slain by the poison of Jormugandr. 230 ATA – The Aesir Immortals are struck down as their descendants begin to conquer the lands of the Jotun. Norland is founded as a nation of the North become the first kingdom in Everyn. Prince Nuada settles his people in the lands that will become Cels. The Tribes of Danu encounter the Fomori a enemy tribe who make war on them and take many of them as slaves. 237 ATA – The Sidhe break free of their slavery and oppression of the Fomori and the Wars of Old begins in the lands of Cels. belief in his son the Thunderer. The Immortals of Norland see their time waning as few of them remain. They thus begin to organize the kingdom in the Four Holds that stand to this day. 280 ATA – the Dvergr race of the Iron Heights forges the Chain of Fate and along with the Norlanders chains the great beast, Fenrir. From Fenrir’s blood are born the Dire Vargs, or Wolves who become the mounts of the Dvergr. Soon thereafter several northerns split away from the Vila and unite with the Dwarves. The Norgard covenant is formed. 300 ATA – The Tribes of Danu rightfully slay Old King Balor as Lugh his half-son kills the Fomori lord in battle. Prince Nuada wielding his magical silverarm allows the Tribes to settle the land of their dead enemies, and summons the chiefs of each Tribe. The Clanns are forged as Nuada is crowned the First High King of Cels, starting the Silver-Arm dynasty. 311 ATA – The Vila fall into civil war as Parun dies leaving them without a chieftain. Those who have tied themselves to the Dvergr move away and join the Norgand lands. A kingdom appears as the rulers of the new land settle on the steppes beyond the Iron Heights. 315 ATA – The dwarf Dvergr Andravi hides a golden hoard in the North Wall mountain range and is later slain by Loki the Trickster. His hoard is cursed when he utters a magical spell upon the gold with his dying breath. 320 ATA – The Clanns of Danu begin to separate as their ancestors begin to disappear. Cels begins to develop further as a nation while High King Nuada rules justly and without defiance. 322 ATA – The Norlander tribes begin to war and bicker amongst themselves. Worship of the Old Gods of the land become prominent. 327 ATA – Caer’s son Duirmuid O Caer-Mor codifies the Codex of Danu creating the canon of the Danuist religion. Impressed by his work, Nuada nominates the man the first Archdruid of Cels. 337 ATA – The Ashurid empire unites under the first Emperor, Sahid ibn Dura. Sahid leads several successful raids against the Jinna clans and quells their rebellions nature on the edge of the great Sand Sea Desert. His son Darhir will establish trade along the Silk Way to the Middle King lands of Qi’in. 346 ATA – A Dvergr magic user goes missing in the Iron Heights. A great beast is said to come to dwell in the land. 372 ATA – The Threefold goddesses of the Tribes of Danu appear with their people the Raven Clanns for the first time since disappear two centuries ago. They state their intent as warriors to Nuada and their leader Morrigan marries the man become the second High Queen of the Sidhe. 407 – Fafnir the Beast awakens as the first of the Dragan, the beasts of madness and harries the lands of the Norgard. The armies push the beast back and the convenant forms into an Empire as the Vila of the country take control from the Dvergr. 451 ATA – The Ashurites formally speak with envoys of the High Kingdom for the first time. The meeting results in a mutual trade agreement as several Ashurid women come to dwell in the growing Vila lands of Vilagifa. 507 ATA – The Ashurid Empire goes to war with the Kalif of the Jinna, as the Sheihks of the Clans eagerly wish for more resources north of the Sand Sea Desert. 563 ATA – High King Nuada is nearly assassinated by an Iron arrow. He outlaws the usage of Iron in the High Kingdom, the Order of Iron forms. 570 ATA – Intrigue spreads in Cels as Nuada is almost assassinated by the Order of Iron. This leads to the foundation of the Brehon judges and the creation of the Secret Police, the Gardai Dubh, or the Black Guards. 571 ATA – Sigurd of the Volsungar Tribe slays Fafnir the Beast and enters into a romantic triad with the Queen of the Huldvolk of Huldaland and the Jarl’s Daughter of Vanaland. Sigurd is eventually killed. Andvari’s hoard is lost to time. 572 ATA – The Holds of Norland elect their first king, Ragnar Liefsson of the Thorings Tribe. Ragnar brings the Jarls of the holds under his fist and unites the entirety of the Holder Class for the first time in Aesir history. 573 ATA – The Jinna declare open Holy War against the Ashurites and the city of Samarkand is sacked. Women are raped and children murdered. The Ashurid Emperor swears a blood oath against the Jinna tribesmen for their horrendous act. 623 ATA – Ragnar King is slain in battle against the Vila warriors of the Norgard Empire, he is returned home and buried at the foot of the Great Oak in Jarlstad, beginning the tradition of the Oaken Kings. 645 – The Norgard Empire invades Norland forcing the Tribes of the Aesir to elect a new warrior Queen by the name of Grimhilde. The woman easily repels the Vila with her iron clad men and pushes the Norgarders back into Everyn greater. 647 ATA – High King Nuada watches the remanants of his friends and allies perishing as few of the Tuatha De Danann remain. 649 ATA – Others discover Andravi gold and become cursed. More Dragans appear in the Northern Wall range. 651 ATA – High King Nuada’s first son the Dagda is declared the High Prince, and is added to the succession. The other members of the Ua Nuada (his clann) are angered and split away from the Nuada to form their own independent membership away from the High Family. This leads to the full establishment of the Ua Nuada as a minor Clann in Cels. 653 ATA – The Holy War against the Ashurid Empire ends and the Jinna are once again pushed back into the Sand Sea. Many of their tribesmen are put to the sword as the Ashurites reign bloody vengeance upon them for the sacking of Samarkand. 656 ATA – The fifth King of the Holds is killed in a duel with a rival tibesmen. The Aesir will fall into a period of petty kingdoms for the next several centuries. 673 ATA – The Norgard armies harry and slay as many of the Northern Dragan as they can. Those found to be cursed by the Gold of Andravi are either culled or placed in chains. Those still free found the Svaraling Clan and pass the curse down to their descents. Founding the mysterious shifting race who fraces the horrible possiblity of become one of the Dragan. 703 ATA – Cels falls into civil conflict as High King Nuada disappears suddenly. His wife at the time, Caer is declared High Regent as her son is not seen yet ready to rule. 730 ATA – Clann Lir of Alba moves to colonize the Isles of Manann off the coast of Alba and Eire. They find the local inhabitants the Ua Fiacha, the Ua Cian, Ua Abcán, Ua Manannán, and the Ua Midir. 731 ATA – Clann Manannán of the Inish-Folk of the Manann isles declares independence from their parent Clann of Lir. This incites naval fighting between the Inish and the lands of Alba. 746 ATA – The Holds of Norland officially declare themselves as the four Kingdoms of Alfland, Svartland, Vanalund, and Jotunnlund. The Jarls become independent petty Kings and the central capital of Jarlstad is left empty. 752 ATA – A war of succession breaks out in the lands of Norgard. A group of steppe folk known as the Parzyk invade and are later subsumed into the military of the empire. 761 ATA – Svaralings are discovered in Svartland and are slain promptly by the Jarl’s men. 800 ATA – The Vanalanders or Vanir of Norland take to their longships and begin to pillage the lands of Norgard and Vilagifa as a means to gain land and riches. This practice becomes known as Vikingr among the Vanalanders. 807 ATA – The Ashurid Empire embroils itself in a war with the armies of Qi’in over the Silk path. Strange warriors appear among the Qi’in soldiers wearig fearsome masks in battle. 865 ATA – The Jinna of the Sand Sea Desert unite under a new Kalif and begin to construct the Holy City of Thebes in the south of Serakim. 871 ATA – High King Nuada reappears after missing for years, High Regent Caer steps down and goes into seclusion for reasons unknown. The Clanns of Cymru begin to fall into blood feud as a Clann War breaks out between the Ua Lugh and the Ua Flidais. 872 ATA – An expedition is sent into the former lands of Prydain and does not return. 884 ATA – Refugees arrive from the lands of Serakim and their origin is unknown. Their colorful clothing; general knowledge of craftsmanship and repair and their strange language cause the Sidhe to dub them as “Travellers”. 893 ATA – The Ashurid EMpire closes Trade with all western powers as war between the ruling Clans of the nobility breaks out in the capital. The Holy City of Thebes is completed by the Jinna who open up caravans through the Sand Sea to circumvent the Ashurite control of trade. 911 ATA – Wars break out among the Holds of Norland. The Alflanders join the Vanalanders in raiding the coasts of Vilagifa. The first Aesir raid occurs on Sidhe soil in Kernow. 931 ATA – High King Nuada dies and the first son of Danu is laid to rest deep within the High Fortress of Cathair Ceochán. His son the Dagda is soon Crowned the new High King of Cels. 987 ATA – High King Dagda marries the daughter of a prominent Ua Lir noble and sets the pace for the early rule of his reign by favoring the conservative Albanach (Alban) Clanns. 1007 ATA – The Holds of Norland see a settlement of their years of Civil unrest. The Alflanders and Vanalanders soon begin to prepare for invasion. After years of planning they launch an invasion on the lands of Cels beginning the two hundred year period known as the Wars of Iron. 1051 ATA – The Ashurid Empire stalls its ongoing conflict with the Middle Kingdom of Qi’in and signs a peace treaty. The Silk Way is reopened and trade begins once again with the nations of Everyn. 1074 ATA – The Travellers having become a visible minority in Sidhe life begin to form into wandering clannish caravans which become a regular sight in eastern Kernow. 1086 ATA – The Ua Lugh kill the Chieftain of the Ua Flidais as the Blood Feuds of Cymru intensify within the local nobility. 1121 ATA – The Norgard succession issue is solved with a vote of the Reiksdag, the Emperor’s line is solidified for the next several centuries. 1128 ATA – Iron poisoning becomes common place as the Aesir unleash volleys of iron weapons upon helpless Sidhe inland. The Clanns ignore the growing threat and bicker amongst themselves. Jinna fight long and hard, but their holy city is sacked by the Ashurite Armies. 1175 ATA – A delegation arrives from Qi’in and speaks with the Dagda secretly within the High Fortress. The delegates then silently disappear into the east never to be seen again. Suddenly, the tides of war against the Aesir turn suddenly as the Sidhe somehow gain temporary resistance against their Iron weapons. On the same day this happens, nine dead Sidhe children are found in a quiet room within the High Fortress. 1194 ATA – After a failed slaving venture results in the death of several souls, the Dagda begins to consider outlawing the practice. 1200 ATA – Peasants along the coast lodge an assault on the Aesir occupiers and throw them out. These commendable individuals are given higher rank than typical Sidhe commons. This leads to the creation of the Client or Fisher Class. 1209 ATA- The Clan gather is in an uproar as the Dagada and a majority of the Clanns outlaw Slavery. This fracturing comes at time when the Wars of Iron see the Aesir taking advantage in the new rift between the Clanns. They silently give Iron weapons to dissidents in the Isles of Manann. The Inish folk of the Isles suddenly rise in rebellion against their Ua Lir masters. 1210 ATA – The Inish Folk are suddenly blockedaded by teh navy of the Ua Lir, their attempt of rebellion is soundly quashed by the their self-proclaimed overlords. 1216 ATA – The Jinna Pharanate fights back against the will of the Ashurite, and are able to press them out of the nearly destroyed city of Thebes. The current Pharaoh, Khuru rallies the nomdadic clans outside the city and encourages their ruler, the Kalif Amir to declare holy war against the infidels from the north. 1221 ATA – The Thoringer, a tribe of Aesir from Vanaland launch an assault into the Great Coil. Their leader Sigurd the Wolf, leads his men and shieldmaidens deep into the coila nd pillage several villages. The next day his and the bodies of his men are found nailed to the trees face in the coast. A warning to all that the Raven Clanns do not tolerate intrudders into their lands. This act marks the true end of the Wars of Iron. the Travellers spreads in the Duchy of Vilagifa and the provinces of eastern Cels. Several conservative courtiers from Alba form the Unseleigh Court as a means to preserve traditional Sidhe culture and national identity. 1230 ATA – Members of several Clanns in Kernow form the Seleigh Court as a means to spread trade and reform throughout the High Kingdom. 1257 ATA – The Blood Feuds of Cymru reach an all new low when the brother of the Sun King is assassinated by an Iron Arrow. The culprit is found to be a member of the Ua Flidais and is hanged on the outskirts of the Ua Lugh’s primary city. eventually topple the reign of High King Dagda. The Order of Brands is official formed. 1265 ATA – The Order of Brands wages sudden gang war on the gangs of the Order of Iron carving out their own territory within the Dark Market of the capital city. 1270 ATA – The gang wars of the capital Cathair Ceochán end suddenly when members of the Order of Iron sue for peace. The dark Gathering is formed in the Dark market as a means to govern crime in the High Kingdom. 1282 ATA – The Ashurid Empire falls into civil war as the ruling Emperor lacks a true heir. The Seven Noble Clans bicker amongst themselves to elect a new leader. 1283 ATA – Several Travellers are massacred in the worse example of non-Sidhe discrimination in centuries in what is called “Blood Wedding”. A Traveller / Sidhe interracial couple is systematically hanged and their wedding party put to the sword by supremacists claming to be from the Unseleigh Court. 1290 ATA – The Holds of Norland face a growing nobility and freeholder class without direction. Guilds begin to form among several members and which are known as Brotherhoods. The most prominent at this time is the Black Oak Sisterhood. 1312 ATA – The Unseleigh effectively clear the Travellers from all of Alba. 1321 ATA – The Norgard Empire begins to expand east into the lands of Ishua and increasingly employs the Parzyk hordes as a means of maintaing order in the eastern Oblast provinces. 1378 ATA – The disunity of the Holds is ended for a short period under the reing of King Ulric the Great who brings many victories against the Norgard settlements pushing closer to the Norlander border. 1432 ATA – The feud between the Ua Flidais and Ua Lugh hits an all time high as the Ua Flidais openly engage the Ua Lugh in Clann War. 1475 – The Holds of Norland unite under the Odining Lord, Sven the Grim, he is voted King of the Holds and goes about reorganizing the Holder Class. 1500 ATA – The Province of Cymru is dissolved by order of the High King after the Ua Flidais storm the Sun King’s primary fortress and slay most of his family. After years of open civil war the province is lost and all Clanns are evacuatd as punish as the act of Clann’s End is acted upon. 1521 ATA – The Ashurid Empire unites under the ruling Istharid Clan and finds elects a new ruler who becomes Farid the First, King of Kings. Cymyri identity remains as many Cymyri begin to dream of reclaiming their lost home. The Duke of Vilagifa signs a treaty with the ruling nobility of Norgard for co-operative protection against Norlander invasion. 1571 ATA – Bres son of the Dagda is born and is forced to abdicate his place to the throne and joins the Ua Nuada in Alba. 1575 ATA – The Inish Folk of the Isles of Manann begin to speak of revolt again. 1623 ATA – Skaldir Elricsson descendant of Ulric the Grim is elected King of the Holds in Norland. 1627 ATA – High King Dagda perishes mysteriously, some claim the vengeance of the Order of Brands is at hand, others say it was natural causes. The Silver-Arm dynasty officially ends with the son of Nuada himself. 1628 ATA – High Queen Aine is elected by the Clann Gathering and founds the Sun-Child Dynasty. 1630 ATA – The High Queen gives birth to a baby girl cementing her claim to the High Throne. Extremist members of the Unseleigh Court under Ua Flidais control attack the Queen’s Progress in Raven Lands inciting Clann war upon the folk of Alba. The Great Clann War begins. 1633 ATA – A new belief appears among the folk of Kernow called the Hawthorn Circle which places the Immortal ancestors equal to the worship of Danu. This causes arguments among the Druids of the Danuist faith. 1645 ATA – The intermittent warfare of the Clanns leads to outright war as Unseleigh and Seleigh factions gear for the High Throne. The Second Battle of Blackwater occurs and the Inish-Folk smash the Ua Lir gaining near autonomy for themselves. -Skaldir the Iron-Bound travels to the Valley of Fate and gains his legendary ax, World-Renderer after defeating six furies in single combat. He returns to the Holds and begins a path of conquest across Norland. 1647 ATA – Ragnar King of the Holds perishes in combat with the Hersar of the Tribe of Freryr civil war breaks out among the Holds. 1648 ATA – Coastal Clanns of Kernow unite under the Swan banner of Caer founding Clann Swan in defense against growing animosity in the land. 1650 ATA – Clann Sea Dragan is formed. -The Allthing in Jarlstad begrudgingly elects Skaldir the Iron King of the Holds. Skaldir’s wife, Siggy gives to a daughter who originally will be his heir. 1652 ATA – Clanns Wolf and Raven form. 1653 ATA – Crafter Clanns of Eire unite their crafthalls and minds under the banner of Fox. Clann fox immediately sues for temporary peace with Clann Raven while fighting back raids from warriors of the Misty Hills. 1654 ATA – King Skaldir’s daughter is lost in a raid by strange assailants, her name is lost to history. 1657 ATA – Battle of the Gold Fields, formation of Clann Elk as it feuds with the Crafter Septs of Clann Fox. The Swan discover secret Fox encampments on their mutual border, fighting breaks out between the Craft Halls and the Ridire of the Coasts. 1660 ATA - Archdruid excommunicates the nemed of the Hawthorn circle. A religious chism occurs with the Hawthorn establishing their own congregation. 1661 ATA – Battle of the Wolf’s Harrow, the Ua Lugh Sept enacts massive casualties on the Flidais for their assassination attempt on the former Sun-Child Dynasty. First Taoiseach of Clann Swan is slain in battle against the Fox. The Ua Lugh pass through Fox lands and begin to gain intel on Clann Wolf. 1662 ATA – The Scathan Court is formed. 1663 ATA – The Sea Dragan invade Fox lands from the south of Alba. 1666 ATA – Clann Heron formed as Clann Elk moves to invade Raven lands. They pay dearly in blood. 1673 ATA – A minor truce occurs when it is broken by the growing bitterness of the Clanns. Clann Heron begins to influence others on the mainland about the existence of the Outlaw Clanns. A minor truce ends as the second Taoiseach of the Swann is slain in battle. Clann Eagle formed to maintain Cymyri nationality. 1687 ATA – Skaldir Skaldirson takes up his father’s ax, World-Renderer and wins the Kingship of the Holds from the Allthing. He is the first dynastic ruler of the Holds in modern memory. 1698 ATA – Skaldir Skaldirson leads a vast armada to invade the lands of Cels. His action causes the end of the create Clann War as only minor fightin remains. 1701 ATA – Clann Raven reveals a new material for weapons and armor, witchwood. A highly expensive material it only becomes available to the nobility who use it to turn the tide in the war with the Aesir. 1705 ATA – The Elk and Fox sign a treaty. 1703 ATA – The Aesir are effectively pushed back by the Six Great Clanns who then hold the first Clann gathering. No High King is elected, but peace is agreed upon with law re-established. 1720 ATA – The Aesir are granted limited landing in Utanstead or Foreign District of the City of Mists. The history of the Altear RPG will be recorded here.